With the Multi Channel oscilloscope software, you are not limited to number of channels of one oscilloscope. It is possible to combine two or more oscilloscopes to form a combined instrument. Once the instruments are combined, the resulting single oscilloscope works just like a normal oscilloscope. There is no limit to the number of channels in a combined oscilloscope. The Handyscope HS5 and Handyscope HS6 DIFF can be combined in any combination of these instruments using their CMI interface. When combining a Handyscope HS5 with a Handyscope HS6 DIFF, the maximum sampling rate of the combined instrument is limited to 100 MS/s. The measuring systems of the individual Handyscope HS5s and/or Handyscope HS6 DIFFs are coupled to each other by means of TP-C50H Coupling cable CMIs which are placed on the AUX IO and/or CMI connectors of the instruments. Between each two instruments a TP-C50H Coupling cable CMI is used. When the instruments are combined using the TP-C50H Coupling cable CMI, they will share the same sampling clock and trigger signals, making it possible to perform fully synchronized measurements on all channels simultaneously. Combining Handyscope HS5s and/or Handyscope HS6 DIFFs is done fully automatically. 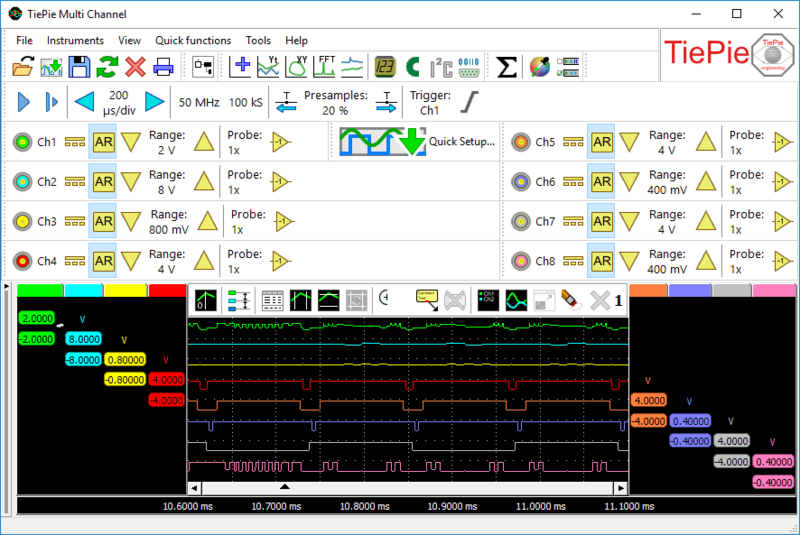 When the instruments are connected to the computer and the TP-C50H Coupling cable CMIs are connected to the AUX IO or CMI connectors of the instruments, the Multi Channel oscilloscope software can be started. It will automatically detect which instruments are connected to each other and combine them to one larger combined instrument. Extra instruments can be added to an existing combined instrument. To add one or more Handyscope HS5s and or Handyscope HS6 DIFFs to an existing combined instrument of Handyscope HS5s and or Handyscope HS6 DIFFs, close the software, connect the new instruments to the combined instrument using additional TP-C50H Coupling cable CMIs and start the Multi Channel oscilloscope software again. The new, larger combined instrument will be detected and opened. To remove one or more Handyscope HS5s or Handyscope HS6 DIFFs from an existing combined instrument of Handyscope HS5s and/or Handyscope HS6 DIFFs, close the software, disconnect the required instruments from the combined instrument and start the Multi Channel oscilloscope software again. The new, smaller combined instrument will be detected and opened. The Handyscope HS3, Handyscope HS4 and Handyscope HS4 DIFF can be combined in any combination of these instruments. The measuring systems of the individual Handyscope HS3s, Handyscope HS4s and Handyscope HS4 DIFFs are coupled to each other by means of a special coupling cable which is placed on the extension connectors of the instruments. For more information regarding this special coupling cable, please contact TiePie engineering. When the instruments are connected to the computer and the special coupling cable is connected to the extension connectors of the instruments, the Multi Channel oscilloscope software can be started. Initially, it will show the connected instruments individually. To combine the instruments, open the Manage instruments... dialog through the Instruments menu. All connected instruments are listed in the dialog. Select the instruments that need to be combined by clicking them with the mouse with the Ctrl key pressed and then press the Combine button . The selected instruments will be combined to one larger combined instrument. Extra instruments can be added to an existing combined instrument. 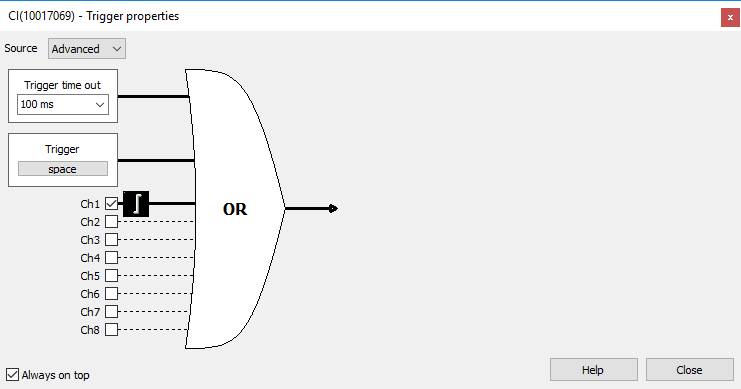 To add an instrument to the combined instrument, first split the combined instrument in the software. To split the instrument, open the Manage instruments dialog, select the combined instrument by clicking it with the mouse and click the Separate button . Then connect the extra instrument(s) with the instruments already contained in the combination, by means of a coupling cable. 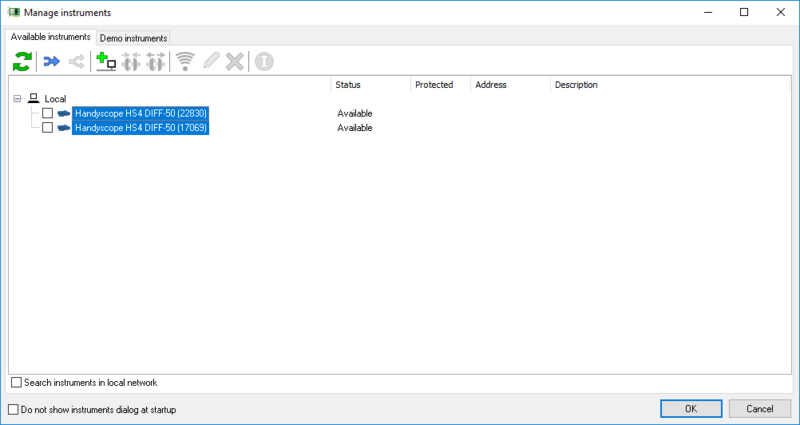 Refresh the content of the Manage instruments dialog using the Refresh button . Finally select all instruments that need to be combined by clicking them with the mouse with the Ctrl key pressed and then press the Combine button . When one or more instruments need to be removed from a combined instrument, first split the combined instrument in the software. To split the instrument, open the Manage instruments dialog, select the combined instrument by clicking it with the mouse and click the Separate button . Then disconnect the instrument(s) that need to be removed from the combination. Refresh the content of the Manage instruments dialog using the Refresh button . Finally select all instruments that need to be combined by clicking them with the mouse with the Ctrl key pressed and then press the Combine button . When multiple oscilloscopes with different maximum sampling frequencies or maximum record lengths are combined, the combined oscilloscope will have a maximum sampling frequency and record length equal to the lowest maximum frequency and record length of the oscilloscopes that are combined.